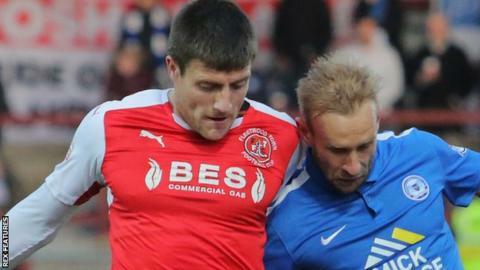 Fleetwood Town forward Bobby Grant is confident they will avoid relegation from League One. The Cod Army are a point above the drop zone after their 2-2 draw with Southend on Saturday, with five games remaining this season. The Lancashire side were promoted to the third tier for the first time in 2014 and finished 10th last term. "We'll stick together and we'll stay up; we'll get out of this," 25-year-old Grant told BBC Radio Lancashire. "I train and work with these lads every single day and I can see the quality that is in the dressing room. "It's very frustrating because the quality that we have we shouldn't be where we are, but for one reason or another we are." Steven Pressley's side play bottom-of-the-table Crewe as well as relegation rivals Oldham and Blackpool in their final five matches. "It's a massive game in the season," Grant said of Saturday's Oldham match. "Probably the biggest that we've played in so far as there is so much at stake. "We're confident that we can beat anyone at home and if the fans get behind us like they have done all season then I'm sure we'll do that."